You are vulnerable to hearing loss at any loud event -- even bars and parties. After winning Super Bowl XLIV in 2010, New Orleans Saints quarterback Drew Brees celebrated on the field with his 1-year-old son Baylen. The young Brees was wearing a pint-size headset. It was more than just a fashion accessory -- the football star was protecting his son’s hearing from the deafening noise of a 70,000-person stadium. Fans at this Sunday’s Super Bowl in Atlanta would do well to follow his example. ABC News spoke to two experts -- Bernard Rousseau, Ph.D., chairman of the department of communication science and disorders at the University of Pittsburgh, and Catherine Palmer, Ph.D, director of audiology and hearing aids at UPMC -- about ways to protect your voice and hearing at the Super Bowl and other loud events. Cheering, booing, air horns, music ... there are many sources of noise at an event as large as the Super Bowl. “Large sporting events, by nature, end up producing sounds that can injure your hearing. Everybody participating should be thinking about that,” said Palmer. The type of stadium matters too. “Super Bowls are usually in domed stadiums and that can help generate even more sound,” she added. Palmer warns that even one loud event can cause damage. At a stadium, people may not able to remove themselves from dangerous levels of noise. So earplugs are key, she said. 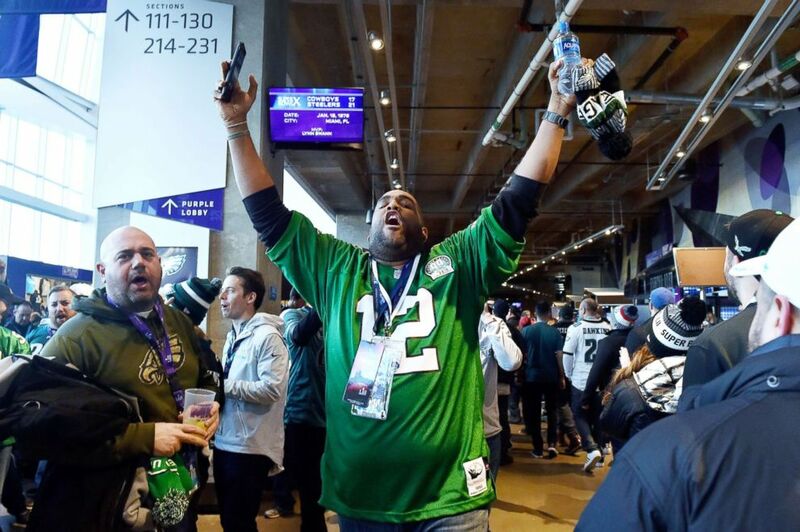 (Hannah Foslien/Getty Images, FILE) A Philadelphia Eagles fan reacts prior to Super Bowl LII against the New England Patriots at U.S. Bank Stadium in Minneapolis, Feb. 4, 2018. Loud noise exposure also causes more than just hearing loss. “This kind of damage produces distortion in your hearing, sometimes ringing in your ears, and you can start to get a sensitivity to loud sounds. There are more things that go wrong than just the hearing loss,” Palmer noted. And one is vulnerable to hearing loss at any loud event -- including bars and parties. “If you’re somewhere where they really have the music up loud, or the crowd is making lots of noise, wearing hearing protection in those situation makes good sense as well. Or move away from the noise,” she said. Hearing aids, however, are not a fix-all solution to hearing loss. For little ones, an earmuff headset is the best solution. (Al Diaz/Miami Herald/MCT via Getty Images, FILE) New Orleans Saints quarterback Drew Brees celebrates with his wife, Brittany, and son, Baylen. The New Orleans Saints beat the Indianapolis Colts 31-17, Feb. 7, 2010, in Super Bowl XLIV at Sun Life Stadium in Miami Gardens, Fla.
Palmer suggests using a phone app to measure noise levels when at big events. Whether at the game or at a party, people tend to shout just to be heard. And damage to your vocal cords can be permanent. Signs of vocal cord damage include microscopic bleeding and growths called vocal cord nodules. Treatment can include surgical intervention or a referral to a speech language pathologist for speech therapy, Rousseau said. Rousseau, however, warned that even the best treatments may not fully repair one's voice. “Julie Andrews famously had vocal fold nodules and those were operated on ... and then she was later unable to sing the way she used to," he said. People often notice right away when something is off with their voice. “Patients will say ‘I remember feeling a pop, or feeling pain at the time,’” Rousseau said. Rousseau advocates for “vocal pacing,” a strategy of monitoring your voice and giving it a break when needed. “Anything you can do to allow tissue recovery after yelling, or minimize your yelling or shouting, will help ... it’s similar to how a coach monitors time-outs throughout the game,” he said. “The other thing that can help is hydration and avoiding irritants like cigarette smoke,” he said, noting that dry air, spicy food and alcohol can also cause indigestion and throat irritation. Dr. Anees Benferhat is a resident physician in psychiatry in New York City and is a member of the ABC News Medical Unit.